Shakhriyar was unable to cope with his temper, imagination and creative mood. In a well-known variation of the Vienna Game he overextended his forces, attacking on both wings (11.a6, 13.f4), but did not manage to hold in the center. Levon’s fine bishop maneuvers (14…Bc8! and 17…Bh4!) created tension in the opponent’s defenses, and then Black began to exert pressure on the weak e4-pawn by 23…Nd7! 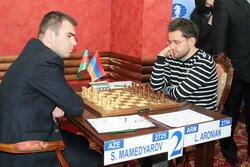 Being short on time, Mamedyarov launched a desperate attack by 24.Nh5, but failed to pose serious problems. In my opinion, White would have more chances to survive after the centralizing 24.Rae1!? In the game Aronian accepted White’s knight’s sacrifices and proceeded to the won endgame with a nice combination – 30…Qxg2+! Vladimir attempted to alter the theory conclusions in a mainstream variation of the Petroff. He made a logical novelty 18.Bf3 (earlier White only played 18.Nf1) and started brining his pieces to the kingside. Rustam skillfully solved all the problems. The accurate 21…Bd6! Forced exchanges and took the sting out of White’s attack. In the subsequent game Black slowly started to take the upper hand. White’s pawn attack on the queenside only created a few weaknesses in White’s own position. 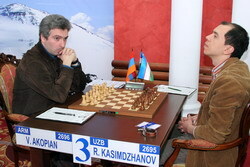 However, at the critical moment Kasimdzhanov did not find the correct solution. Playing 35…Qf5! (with the idea 36.Qc4+ Qe6!) Black could hold the extra pawn and obtain decent winning chances, while after 35…Rf8, which happened in the game, White restored the material balance and soon the game was drawn. The younger Petersburger played a strong novelty in a fashionable line of the Slav Defense (14.0-0! instead of 14.cxd5), got a big advantage, but was unable to convert it into a full point. Svidler’s reaction to the new move was probably bad. Instead of the dubious 16…Rb8 he should have played 16…Nb6! in order to look for equality in a position with opposite colored bishops. Alekseev then failed to develop his success. He missed the energetic 20.Nc5!, which intends to meet 20…a5 by 21.Nd7!, winning a pawn. The same invasion looked equally strong on the next move. The final mistake was made on the 22nd move by 22.Rc8. 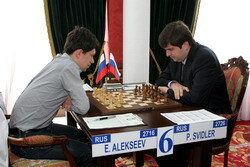 I think Evgeny should have taken the risk and capture the a6-pawn with the queen. My analysis confirms that Black’s initiative in this case in temporary and evaporates quickly. The text-move was followed by mass exchanges, and an extra pawn in the endgame could not console White. The position was drawish, and the result confirmed it. Both sides played very non-standard and creative, which surprisingly quickly led to a dull and equal position. Already on the move 5 the position was completely original! Instead of 5…Bb7, which was played earlier, Etienne selected 5…Be7! ?, and then bravely opened the center by powerful pawn thrusts (8…b4 and 10…c5). I have a feeling that White’s play in this game can be improved, and he really could obtain an opening edge. Perhaps, instead of 13.dxc5, Vassily should have maintained the tension by 13.Qe2, in order to find a more convenient way to resolve the central tension later in the game. After the text-move Black undertook series of exchanges (I would like to draw your attention to 16…Bxf3! ), simplified the position completely and made a draw easily. This game is just another nightmare of Capablanca. 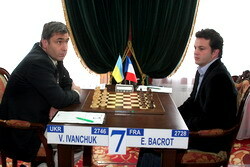 The third world champion predicted the drawing death of chess due to increased skill of the players. Even wild complications often end peacefully, if both sides are up to the task. This is exactly what happened in the duel of the Ukrainians. The storm has passed, and a simple endgame arose. White’s symbolic advantage was not sufficient to play for a win. 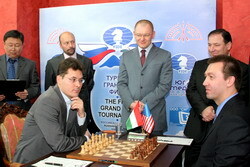 In the Tartakower-Makogonov-Bondarevsky Variation of the QGD the players found new nuances in a well-known position. Grischuk implemented a novelty 19.exd4 (Timman played 19.Nxd4 against Kasparov 11 years ago), and Gelfand immediately made a mistake. He should have restricted the White’s queen by 19…g6!, improving the kingside structure along the way. After 19…Ba8?! 20.Qf5! White created unpleasant pressure. Maybe Black could survive by the tricky 19…Nc5! (with a textbook trap 21.Nxd5 Bxd5 22.Qxd5? Nxa4! 23.Bxa4? Rxb1 24.Rxb1 Qc1+! ), but calculating all the resulting variations was next to impossible. After 23.Ne5! White’s advantage became significant. It is easy to criticize 25…a6 (which created another weakness in Black’s camp), but it is hard to suggest an alternative. Defending without any counterplay is a very tough task. 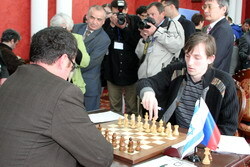 Grischuk converted his advantage in impeccable style. Black did not equalize in the anti-Gruenfeld. The novelty of the American grandmaster – 12…Be6 – seems weaker than the usual 12…Nc7. In the subsequent game the e6-bishop became a problem for Black due to the Nf3-g5 threat. Looking for the solution, Gata opened the center (14…f6), but Peter replied with strong counterattack. The spectacular 17.d5! underscored Black’s weaknesses. White’s attack was parried at a high cost of damaging the pawn structure. Leko maintained the tension and created unpleasant threats. No wonder that at some point Kamsky decided to give up material to complicate things. He could probably abstain from the queen sacrifice 32…Rxf4 and continue resisting by 32…Qd7 (or 32…Qd5), and it is hard to suggest anything concrete for White. 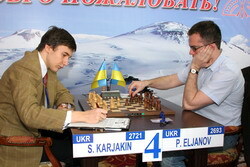 The game proceeded to an endgame, which was objectively lost for Black; however, it ended in a draw. Peter wasted a lot of time before the control and made a few mistakes, eventually missing a well-deserved victory. On the other hand, Gata deserved this draw, because he fought bravely and never lost his spirit.